Cassam Uteem G.G.S.K. was born in Port Louis, Mauritius, on 22 March 1941 and is married with two children. He studied at Paris VII University where he received a Bachelor’s degree in Art and a Master’s degree in Psychology. 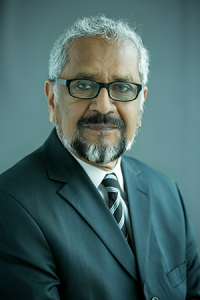 He is the holder of a Certificate in Social Work from the University of Mauritius and a Diplôme d’État Français d’Assistant des services sociaux. Mr Uteem has a long history of involvement in politics, both at the community and national level. As a youth leader and social worker he was involved in local community work and in the struggle for the Independence of Mauritius. In the early seventies, he joined the leftist political party the Militant Movement of Mauritius (MMM) where he rose to become its deputy-leader. Mr Uteem was nominated to his first formal leadership position in politics in 1969 when he was elected at the Municipal Elections to serve as Councillor of the City of Port Louis. He remained in this position for several years and became the city’s Lord Mayor in 1986. In July 1992 Mr Uteem was elected President of the Republic of Mauritius, and was re-elected in 1997 for a second 5-year term. He resigned from this post in February 2002 after refusing to give his assent to the Prevention of Terrorism Act (POTA). Cassam Uteem has since been very active in the field of international public policy. He is currently one of the Vice Presidents of the Club de Madrid, member of the Governing Council of Interpeace, Member of the Africa Forum and founder-member of the Global Leadership Foundation (GLF). He is also the President of ATD Fourth World International Committee. He has been and is still closely associated with the Groupe Refugiés Chagos (Chagos Refugee Group) and the Chagossian community, (forcibly removed from their islands to make room for an American military Base in Diego Garcia) helping them in their struggle for their rights including their right of return to their native islands and of full reparation for their eviction and the life of misery they have been leading ever since. He is the Chairman of the Board of Trustees of the Chagos Solidarity Trust Fund set up to contribute, inter alia, to the advancement of the human rights and fundamental freedoms of the Chagossian Community and the preservation and promotion of its heritage and cultural resources. Between 2002 and 2015 he has led several Electoral Observation Missions for the African Union, the Commonwealth Secretariat, the Carter Center and the Electoral Institute for Sustainable Democracy in Africa (EISA) in the Maldives, Sri Lanka, Bangladesh, Lesotho, Madagascar, Egypt, Tunisia & Zambia. In January 2015, UN Secretary General Ban Ki-moon appointed him as his Special Envoy and Head of the Electoral Observation Mission in Burundi.